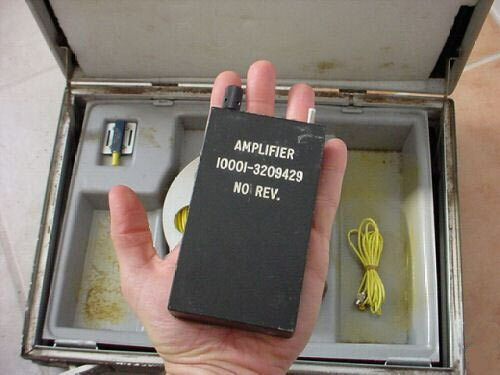 This is an older style high grade wall mic with a super audio amplifier likely made in the 1960's or early 1970's for federal level Intelligence. It came out of a pawn shop. The story goes that two "professional looking" guys in suits walked in the pawn shop with this kit and said it was no longer needed by their "company". There were several employees and customers around, and after those two fellows left, they all agreed that those guys were FBI, CIA or something, even though they didn't say much. This unit is very well built. The electronics inside the aluminum cased amplifier box are totally sealed in resin, so apparently it's waterproof. 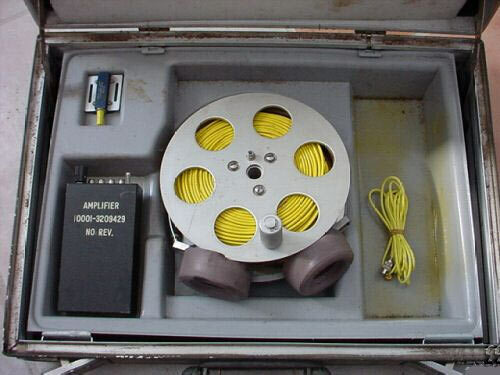 It has an aluminum reel with tons of cord on it that hooks to the little accelerometer. 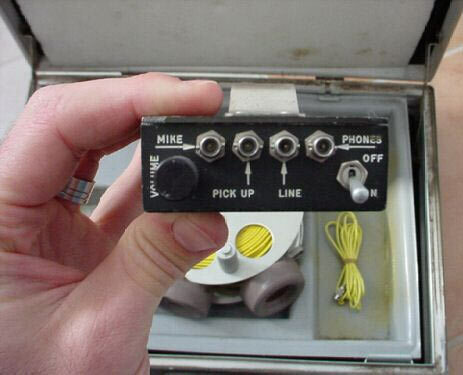 All this is packed in an OD green "briefcase" with the letters MK 15 Kit A cell.